Fortinet traded in line with the broader market last month and has continued to lose ground in November despite a strong earnings report. Shares of Fortinet, Inc. (NASDAQ:FTNT) dipped 10.9% in October, according to data provided by S&P Global Market Intelligence. The stock fell amid a broader market sell-off and saw share price movements closely in line with those of the S&P 500 index. 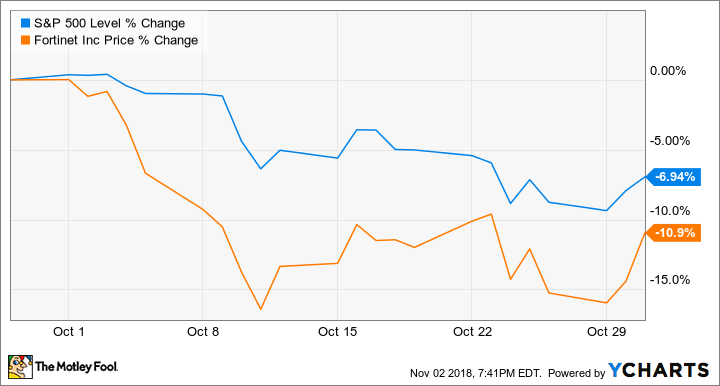 The cybersecurity company was actually added to the S&P 500 on Oct. 11, and being part of the index can sometimes have a beneficial impact on stock performance because shares are purchased as part of exchange-traded funds. However, in light of market sell-offs and despite some encouraging company-specific news, Fortinet was one of many stocks to record double-digit declines last month. Investors shouldn't read too much into Fortinet's sell-offs last month, particularly given that major U.S. indices posted their worst percentage drops since February 2009. The company appears well positioned in its corner of the cybersecurity market, having been named by Gartner in September as a leader in unified threat management (UTM) for small corporations for the ninth year in a row. Gartner also named the company as a credible challenger in wide-area-network (WAN) edge infrastructure for the first time and once again named it as a leader in enterprise network firewalls in October. 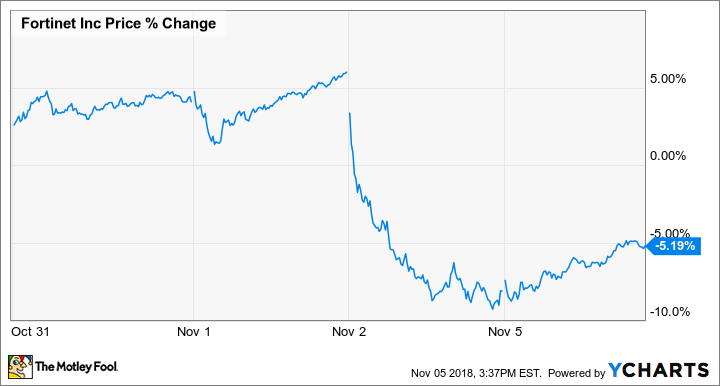 Fortinet stock has continued to slide in November, with the stock trading down roughly 5.2% in the month so far on the heels of its third-quarter earnings results. Fortinet reported its third-quarter results after market close on Nov. 1, delivering a 21% year-over-year sales increase to reach revenue of $453.9 million and a 71% increase in adjusted net income to hit $86.7 million. Those results were far from bad, but investors might be showing some hesitance to embrace companies with growth-dependent valuations in light of October's market contraction. Fortinet shares trade at roughly 42.5 times this year's expected earnings and seven times expected sales.